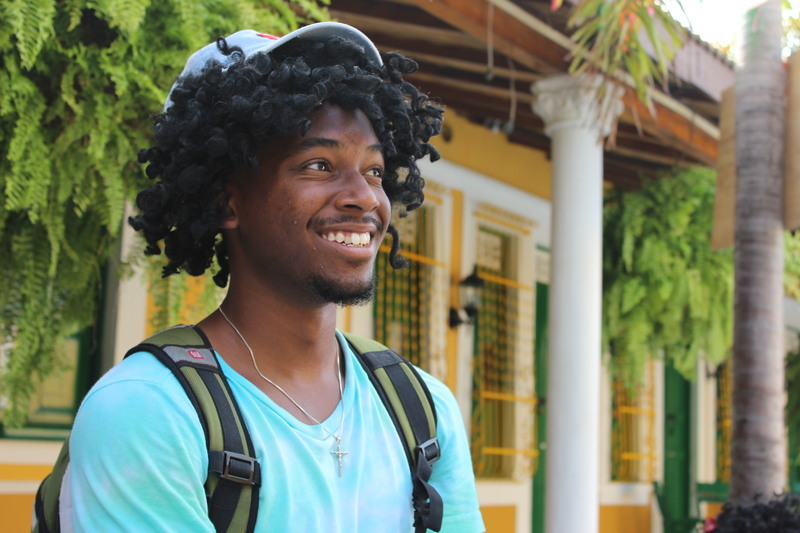 Afro-Latinos, and the belief that Colombians speak the best Spanish. I could not have picked a better place. I’ve flown a plane once in my life when I was not even a year old, so just flying to Barranquilla is a huge first for me. As an aspiring sociologist, I like looking at everything around me to understand what makes the society function. From the second that we landed in Colombia my mind was racing, as I was constantly looking at how the people interacted with one another, the infrastructure, the food, Afro-Latinos, and even the types of cars (and the crazy way they drive). I also tend to compare Barranquilla to Baltimore, and there are plenty of similarities, so I do not feel out of place when I am out and about in the city. Still, this city is very unique and I am enjoying it. 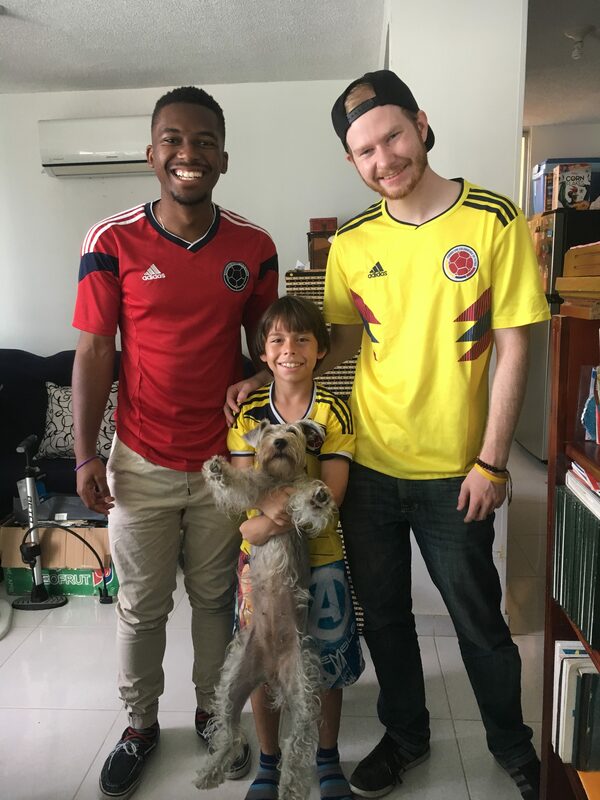 I have a beautiful host family, and each of every one of them, including their nine-year-old, is interested in learning about U.S. culture as much as I am interested in Colombian culture. 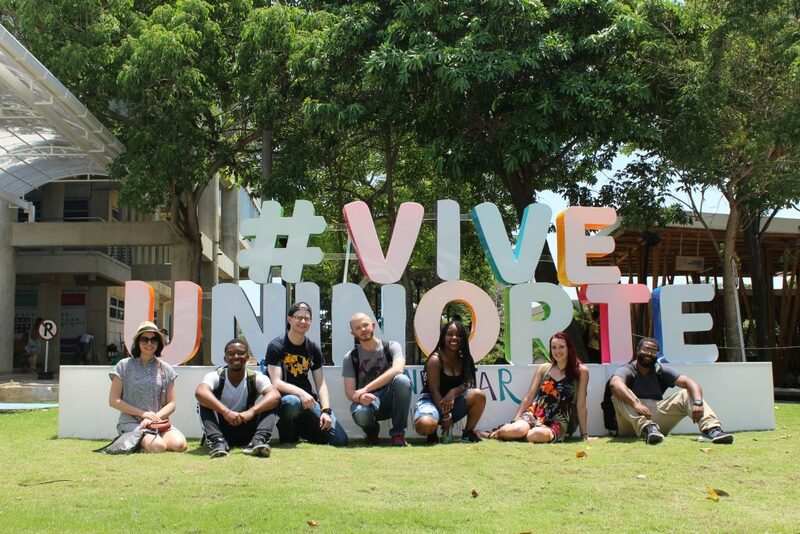 The university, Universidad del Norte, is also a beautiful, artistic campus. I don’t at all mind waking up to come to this campus and attend classes. I have also met amazing people from UMBC also on this trip. The friendships we’ve made are great and have made this experience easier for me. 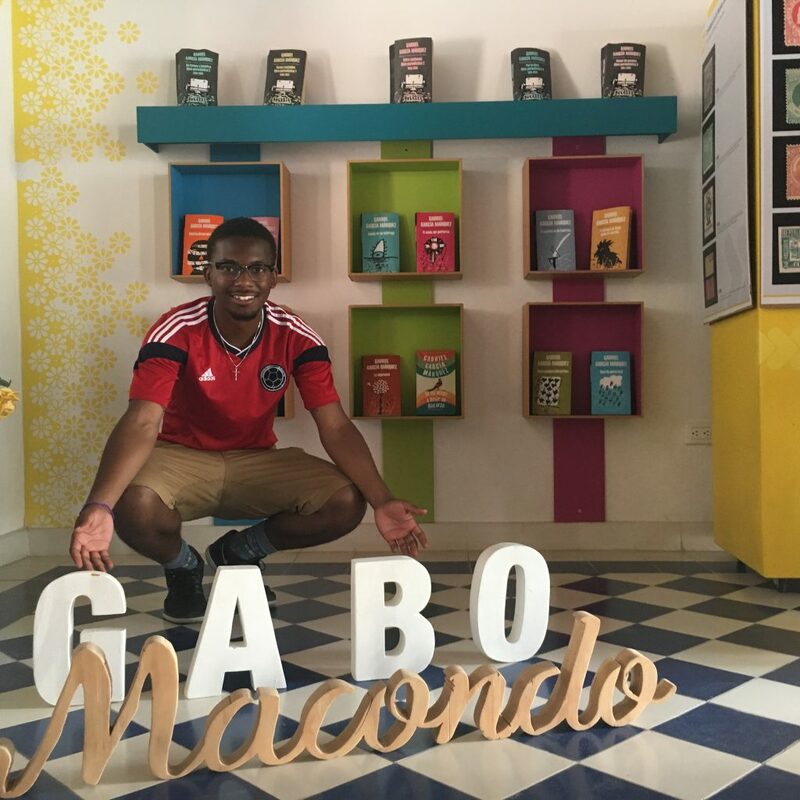 We’ve traveled downtown to see Biblioteca Piloto del Caribe, a library that is a cultural site, with an art gallery that used chess boards to tell the country’s culture. I can’t wait to explore the city even more. Of course, the biggest highlight was visiting Cartagena during the holiday weekend. 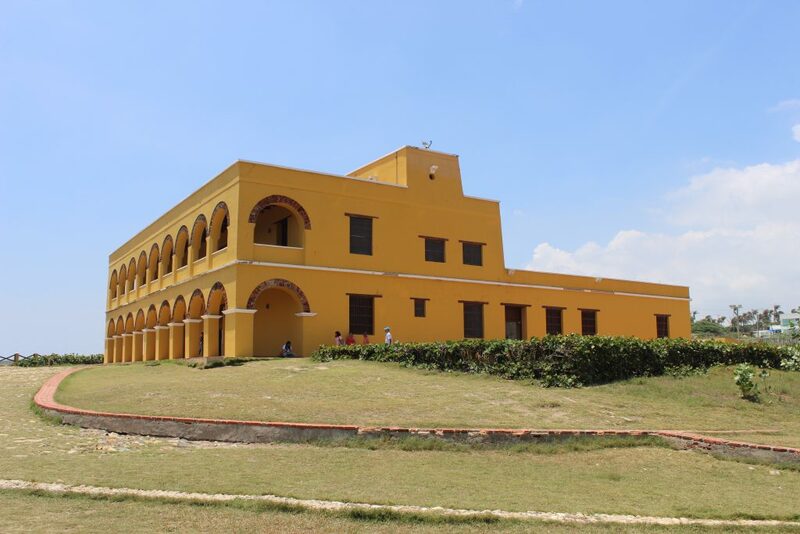 We took a city tour bus the first day to see Castillo San Felipe de Barajas, a fort constructed in Cartagena in 1536 to protect the city during, as well as the old walled city, commonly referred to as Centro Histórico. There were beautiful buildings, and even a wedding in the process while we walked through the city. The next day, we took a boat ride to Hotel Isla del Pirata, an island about an hour away from Cartagena. The water was so clear and the meal with pescado frito (fried fish) and arroz con coco (coconut rice). No one wanted to leave when the bell rang for the boat to take us back. Later that night, some of us returned to the Centro Histórico to see the sunset. The last day in Cartagena, me and a couple of groupmates visited the Getsemaní, a neighborhood full of bright colored buildings, graffiti art, and murals, each with their own individual meanings and themes. I think it was easily one of the favorite areas in the city, except for the hot sun. Two weeks has already flown by, but I have been loving every minute about it. This past week, our group volunteered to visit local schools to interact with the students. It was great practice on both ends, the students practiced English while we practiced Spanish. At one class I went to, it was a karaoke competition. One of the students had to sing “Cheap Thrills” by Sia, and he did pretty good (He must listen to the song often). Me on the other hand, had to sing “Waka Waka (This Time for Africa)” byShakira, the anthem of the 2010 World Cup, and I did horrible. I have only listened to the song maybe five times in my life, but the students said I did okay. I went to classes for 11th graders and 5th graders, who both showed me cultural dances from the area, such as Champeta. In one class, we ended up having a dance party, and we all shared dances with each other. Champeta looks fun to learn, and one of the students even described it as “stomping on ants.” It felt so good to meet these students, because they were as excited to talk with us as we were with them. We took pictures with one another and even exchanged Facebook names, even my YouTube channel. I like to believe that visiting these schools, we made some sort of positive impact on their lives, because for me, they definitely made an impact on me. I only wish that we could have stayed at the schools for more than 2 hours. Our classes are starting to pick up, with more practice and exercises in class that force us to use Spanish in different circumstances on the fly. It has been difficult, because there are times when I understand exactly what someone is saying in Spanish, and times where it all flies over my head, no matter how hard I try to understand. Not to mention, that sometimes when I speak, natives don’t understand because I don’t say the right words and because of the lack of the Colombian accent (or any accent at times). But that’s what I am here for. And my Spanish skills have already begun to improve, since my host family speaks to me Spanish almost all the time, and when I am out and about, I must be confident in how I speak in order to get by. So, while I have been questioning how incredibly difficult it has been, I appreciate how hard I have been getting better. In class, we are reading “Crónica de una muerte anunciada,” or “Chronicle of a Death Foretold,” a novel by the highly respected, legendary, Colombia-born, Nobel Prize Awarded author, Gabriel Garcia Márquez, or Gabo. It has been tough to read since it is in Spanish, but the story is great so far. I encourage others to read the story, or any of his books, honestly. Many Colombians would say the same. 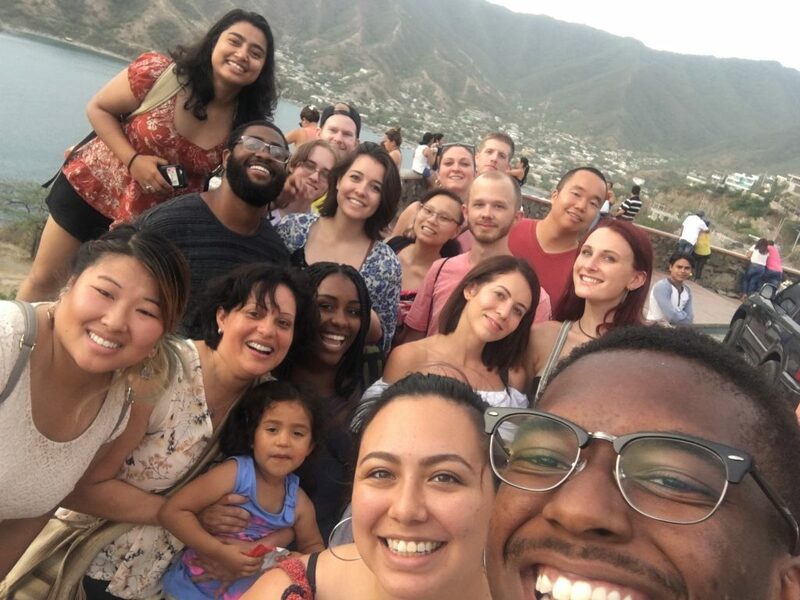 It only made sense that we read one of his stories, because our group stayed the past weekend in the city of Santa Marta and took a trip to Aracataca, the hometown of Gabo. 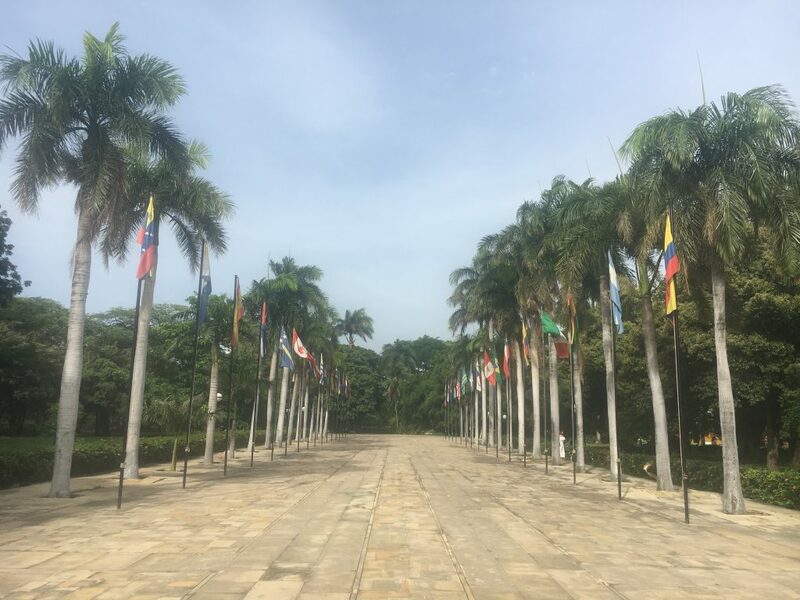 The first day in Santa Marta, which is also the day that I did the Instagram Takeover, we took a tour and visited La Quinta de San Pedro Alejandrino, which was home to Simón Bolívar, the first president of Gran Colombia. He was originally born in Venezuela, but made a great impact on Colombia. We also visited the Museum of Gold, which told history of the Tairona, a native people that were close to Santa Marta and who were known for the advanced techniques in ceramics and shaping gold. Then we went to the area on the outer mountains of Taganga, where we could see the sun in the distance over the open sea. It was very popular spot because so many people parked to take pictures there. Our group took a bunch of pictures and we even got a nice group selfie. The next day, we took the trip to Aracataca (or Maconda, as commonly named to in the stories of Gabo). We saw the train station that appears in his stories, as well as his home, filled wall to wall with famous quotes and excerpts from his novels. While I have never been exposed to the work of Gabo, I am very interested in reading about him. He has left a legacy and influenced many with his life and his stories, even me now. Aside from being a writer, he showed a lot of care and generosity for the public. He was a close friend of Fidel Castro, and when Castro imprisoned some political writers for their work against Castro, Gabo advocated for their release, and Castro went through with it. He showed no fear or silence as many would assume, and I love that idea of a person. Week three is upon us, and we still have a lot to explore and learn. At this point, the trip begins to relax and we have more free time. No more scheduled big city trips, unfortunately. During the school week though, we are beginning to attend classes with local students. I attended a business psychology class for the first class, and it was bit difficult to understand what everyone was saying. Some of the students would read off the board, so I could see what they were reading as well. Still, they read so fast that I couldn’t keep up with them, and I did not hear them make every sound in the words they were saying. Nonetheless, it was exciting to learn something in another language, and I was able to grasp the concept of the lecture (The factors that go into balancing mental health and skills in a business setting). 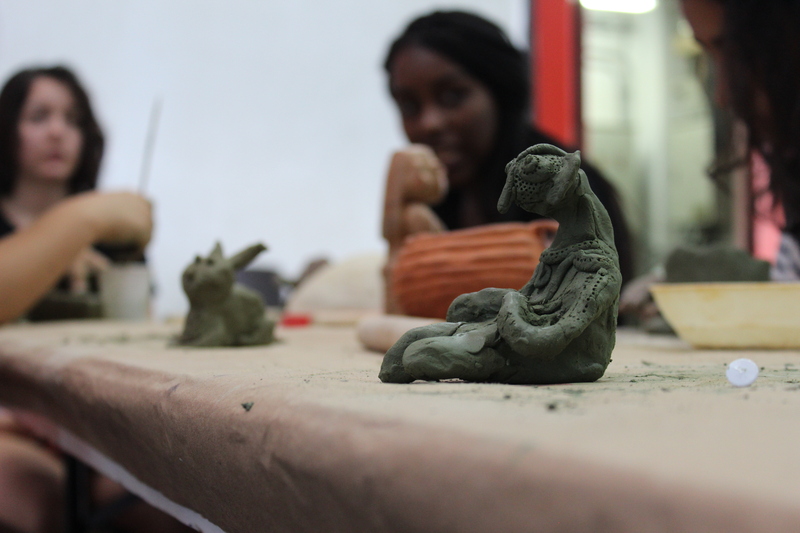 We also had a few arts and crafts sessions. 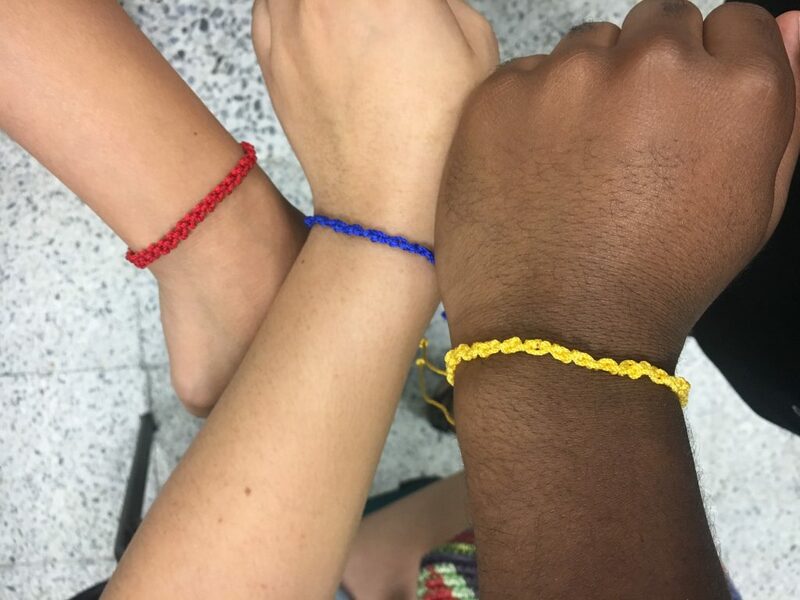 One day, we took string, which was pretty strong, and made bracelets (I made a yellow one). We learned how to do it from a woman who makes indigenous jewelry and sells it herself, and she had some beautiful looking I thought about buying from her. During the weekend, we visited the Mapuka Museum, which is on the university campus. Like the indigenous did, we crushed colored stones down to dust, added water, created clay, and you can guess where we went from there. We also looked at the exhibit that held arts from indigenous groups, including the Tairona, from thousands 25,000 years ago to just a few decades ago. One of my favorite pieces of art was a necklace, completely made of sticks on a string, and it reminded me a lot of the necklace that the Black Panther wears on his suit. After the museum, a bunch of our group visited El Centro, or Downtown Barranquilla, just to walk around and explore more of the city since we had the time. It was very busy, vendors and taxis all over the place, but still an exciting place to visit. I bought an empanada (a breaded food) that was freshly made, with meat and cheese, and it was the best one I’ve ever had. I also bought fresh lemonade from another stand. I was surprised at how good some of the food was fresh from a food cart in the middle of the sidewalk (I promise that I am not sick from the food). Some of our group found a very authentic restaurant in the area. It was an open area, with a unique style of a restaurant that you usually see in cinema, with an antique, country style restaurant that you would see Anthony Bourdain eating at. I was a bit skeptical, but the plate of food that I got was great. It came with rice, sausage, ground beef, egg, beans, and a plantain. Afterwards, we looked inside some of the shops on the main street to see what they sold (a lot of knockoffs, of course, but some stuff looked good regardless). The next day, Sunday, was a free day, so I did a lot of relaxing, went to the pool in my apartment complex, then went to the mall. The mall is huge, beautiful, and full of stores by the way. We found a restaurant that serves tacos, and got some delicious crepes from the famous Crepes & Waffles. It was a nice ending to a very relaxed week. On another note, I find myself struggling to interact with locals, usually due to the fear of speaking incorrectly, and I am a pretty reserved person. Regardless, it is important that I step out of my comfort zone, because if I don’t, then it will be my biggest regret when I leave Colombia. I would love to have relationships with people that extend across waters, and have people to practice Spanish and explore more of the city with. Who knows? Maybe I meet someone and it becomes beneficial in the future. 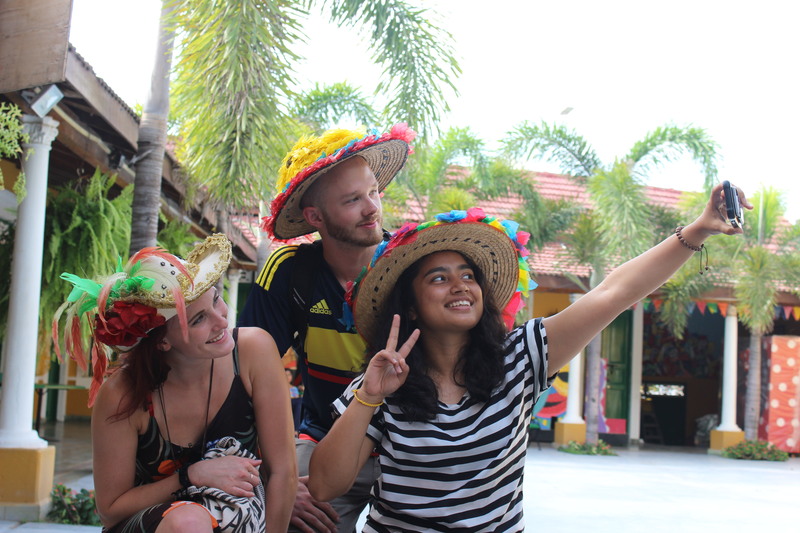 But others from the group have been helping me feel more comfortable about speaking Spanish and encouraging me to be more amiable and confident. To end this off on a good story, about a week and half ago, I was getting lunch on campus in a sandwich restaurant, and it was my first time going. When one of the preparers was waiting on me to tell my order, I took a while to think, and a guy behind me asked if I needed help translating. I didn’t need help and I told him I was fine, but we continued to talk. Like others who notice that I am not local, he asked where I’m from. I tell the guy that I am from the U.S., Baltimore, MD to be specific. His eyes sort of lit up. He responded that he just got offered an opportunity to teach and learn at Johns Hopkins University in Baltimore the upcoming fall! How crazy is it that I ran into him in a line to get a sandwich! He teaches engineering on campus, and he got the opportunity to teach at JHU. Others from my group entered the conversation, we exchanged Facebooks, talked about where Ivan (the name of our new friend) should look for a place to live, where to visit when he finally moves, telling him to contact us when he arrives, etc. Now we’re all in a group chat planning a lunch date before our stay is over. 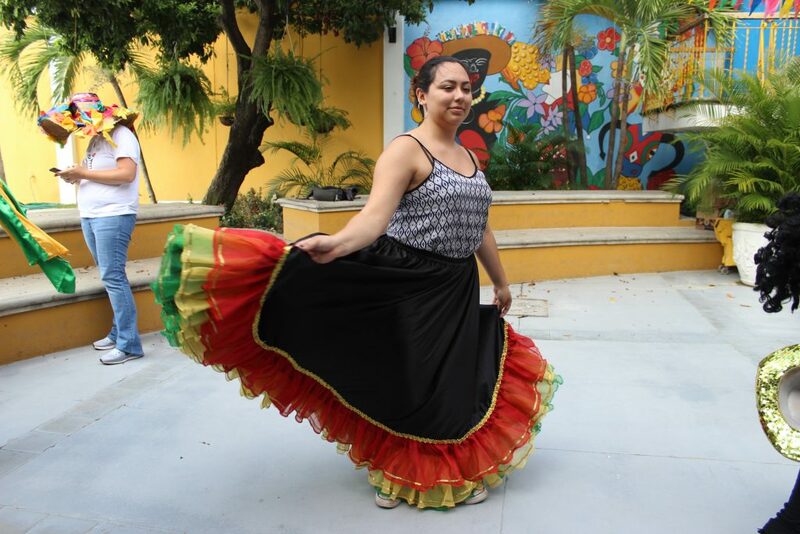 dance classes on campus, learning the music and dances of champeta and vallenato, which are traditional dances here in Colombia. We’ve explored more the city and have seen great sites. We visited the town of Usiacuri to visit the Julio Florez Museum. Florez was a famous poet and while I couldn’t take pictures of his work, one did stick me. Titled “Al Odio” it addressed the lack of understanding that people have towards others because of their own intentions, and how it causes hate and misunderstanding of others. I am aware of the unspoken and spoken hate that exists in the world, and in the same sense of Florez, it’s not worth it and helps no one. 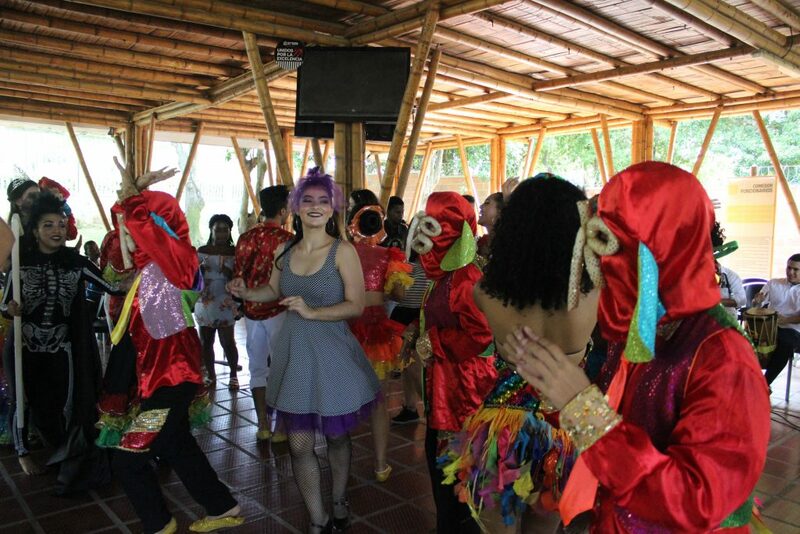 We also visited la Casa del Carnaval to learn of the annual Carnival that happens in Barranquilla. We learned how it began as a celebration of all the history, music, and culture of the many people in Colombia. I loved to learn of the African influences especially. A lot of the masks we saw represented animals, and we were able to listen to music, like Cumbia and Puya, that was influenced by African culture. Also, the staff there gave us some cultural clothing, like dresses, masks and costumes, and I got to wear a curly headed wig. 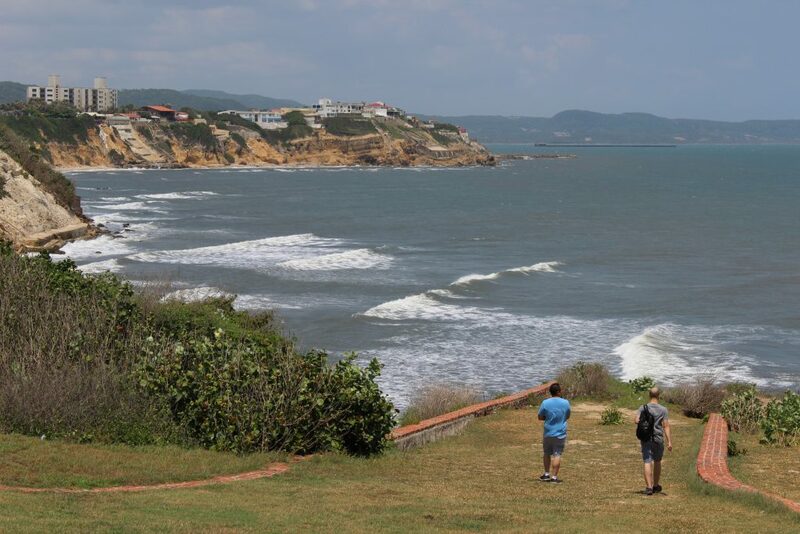 We spent the next day in Puerto Colombia, not too far from the city. We visited Castillo de Salgar, which is this bright orange/yellow house near a cliff right next to the water. With a sight over the ocean, it’s hard to not stop and look at how beautiful it is. We also stopped in the local town for something to eat by the beach. Most of us ordered the fish because why not? The fish here is good, especially coming straight from the ocean. Besides the iconic sites on the coast, some of us took some time out of the week to do some regular activities. You’ve been to Sky Zone before, right? Well, Zero Gravity is better. Located in the mall called Viva, is Zero Gravity, a trampoline park with a jousting pit, a wall climb, and an obstacle course. I felt like a child in that place, I cannot lie, but it was fun to do it with the group. I achieved at performing a backflip (after failing the first few times and falling on my face), knocked some people into the jousting pit, and raced kids to the top of wall climb. Not to mention that I of course dominated the obstacle course. The highlight of our time there was the music they played through the speakers. When “God’s Plan” by Drake, began to play, we basically had a mini dance party. It surprised us though when some of the other kids and teens there with their family started singing and dancing with us. We didn’t feel out of place, rather more comfortable. I can’t forget about the underground go kart racing either, since the cars drove fast and I won the second race we did. It felt good to enjoy some regular old activities. With the trip coming to the final week, my biggest focus is making sure I get everything I can out of this trip. That means exploring the cool hangouts in the city, the art, and doing some souvenir shopping (especially for my mother because she wants something representative of Afro Latino culture here). Also, I have met some cool people at the university, and even made friends when travelling around the city. I want to use this final week to really build on the relationships I have made so far. I am also going to do a lot of reflection about what I have learned, my ups and downs of the trip, and what this trip has benefitted me. And this trip has down a lot for me. I will get back to you with everything next week. to eat at La Cueva, a famous restaurant in the city, created by many influential persons who came to eat and gather, including Gabriel Garcia, Marquez. The food was very food, there was a music performances, and there was a video and treasured items throughout the restaurant to praise the creators of La Cueva. 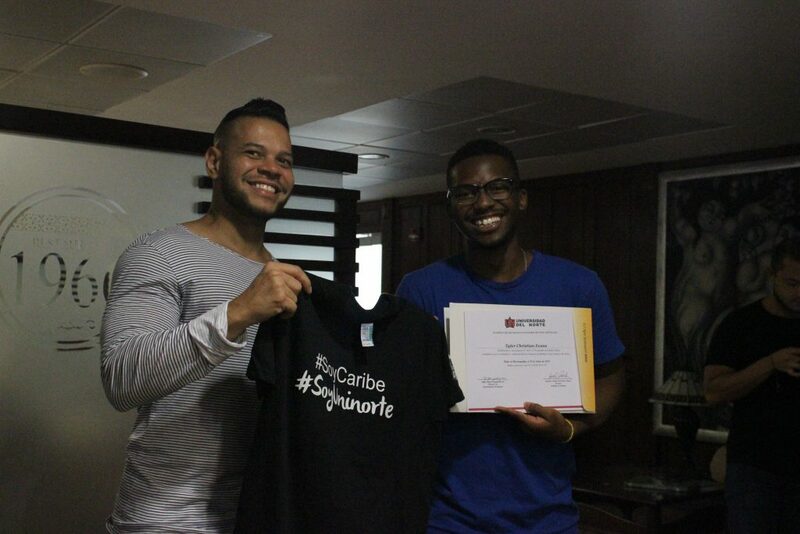 We had a very nice closing ceremony from the wonderful staff and students at Uninorte on that Friday. We took a trip to a local shopping fair, where I purchased a few gifts for friends and family (local artwork for my mother, especially). Upon returning to school, a group of students and staff from the campus performed a traditional performance of Carnaval, previo usly mentioned in my last blog. A mix of story-telling, dancing, singing, acting, and costumes overwhelmed me, and while I was taking pictures, I couldn’t help but stop and be hypnotized by the passionate performance. They then invited our group to joinin on the dancing. Afterwards, we went to 1966, the fancy restaurant on campus, where we were first introduced to the program on Day 1. 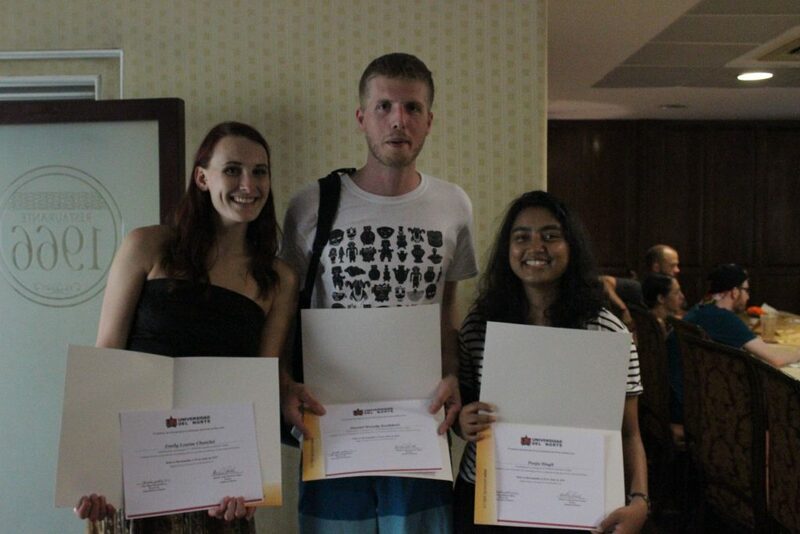 We received our certificates of completion, farewells from the Language Department and teachers, and ate brownies with ice cream. As for the final weekend, it was the time to really get out, see the city, and interact with locals. While we had the option to go to a few different places on the coast, I decided to keep myself in Barranquilla. I felt this place is where we started and where I should end the trip. 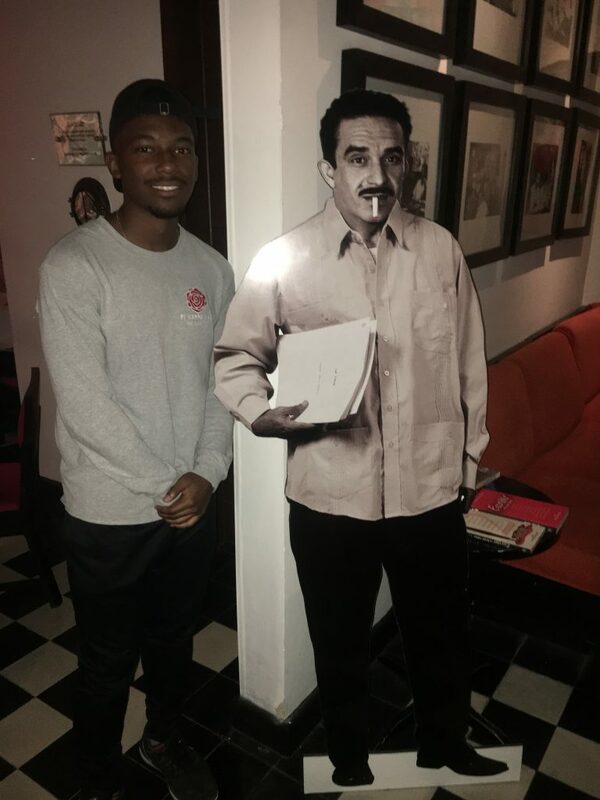 That Saturday night, another student on the trip, Zaki, and I were invited to a birthday party by a local friend at a Mexican restaurant, Fabio’s. We all ended up spending the rest of the night together, hanging out, dancing, driving to different areas of the city, and celebrating. What surprised me most about travelling through the city that night was the similarities the city had to Baltimore. Honestly, the neighborhoods, and housing set up, reminded me so much of Baltimore on the west side (not the best area, but the resemblance was there). The next day, Sunday I did end up relaxing more than I expected, and took care of some necessary work to finish before returning home. 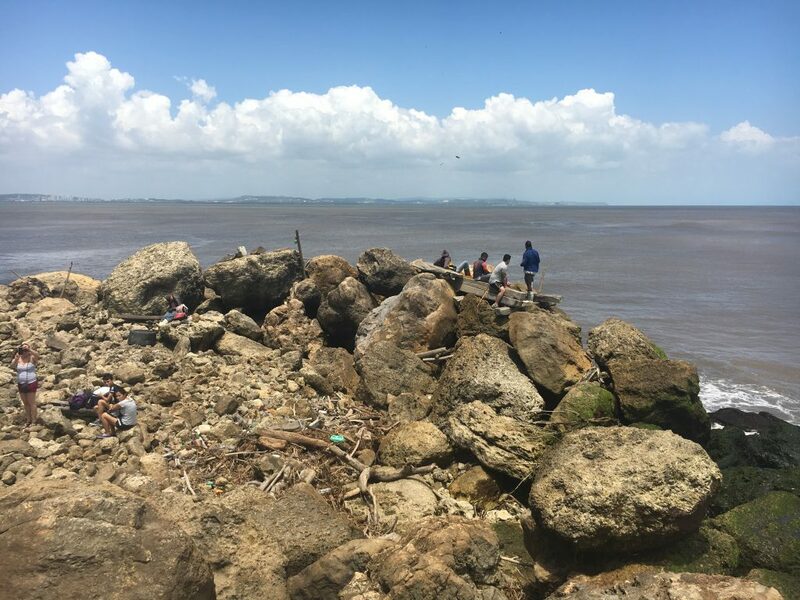 Monday though, the last day, Zaki and I traveled out to Bocas de Ceniza (Mouth of Ceniza) with run along the Magdalena river towards the Caribbean Sea. The trip has the option of a small train ride to reach the end of the path. It starts with a small train cart that travels along the river (kind of shaky and nerve racking at times, but not too bad) There are a few stops at the beach and restaurants along the way. I bought a coconut at one stop. Eventually it become a narrow path, with the river on one side, and the sea on the other side. One we leave the train, we walk about 15 minutes pasts some shacks for drinks and snacks, shacks for fishermen, and boulders (a lot we had to walk on). Eventually, you can reach the edge and climb rocks and look right over the water and waves crashing below you. Fishermen stood along there trying to get catches. Afterwards, Zaki, and I ended up walking about 45 minutes back after a miscommunication of the arrival time of the train to pick us up. Nonetheless, it was nice walk with beautiful sights and we talked the time away. Eventually we encountered the train at an earlier stop (which was going to come to the pickup point in another hour,so we just misunderstood haha). So, we sat at a restaurant, had some lemonade then waited for the train to take us back. I returned to the fair for some additional gifts, then headed back to my host home to actually start packing since we left at 4 am the next morning to make the plane flight. After I finished, I was invited by the same local friends that I went out with on Saturday, since of them lived in the same apartment complex that I was staying at. I went over to spend my last few hours there with them. We played games such as UNO (with some special rules, of course), Twister, Heads Up, and a local game called PARQUES, which is similar to Sorry with some different rules. We watched music videos, a couple episodes of a reality talent show, and one friend, named Angela, went through a large deck of cards with Spanish words on them to build my vocabulary. It was a relaxing night that let me know that WHEN I return, I know that I have friends that I can call to hang with. And that it some I value the most from this trip, the relationships that I made that will last across borders, overseas. 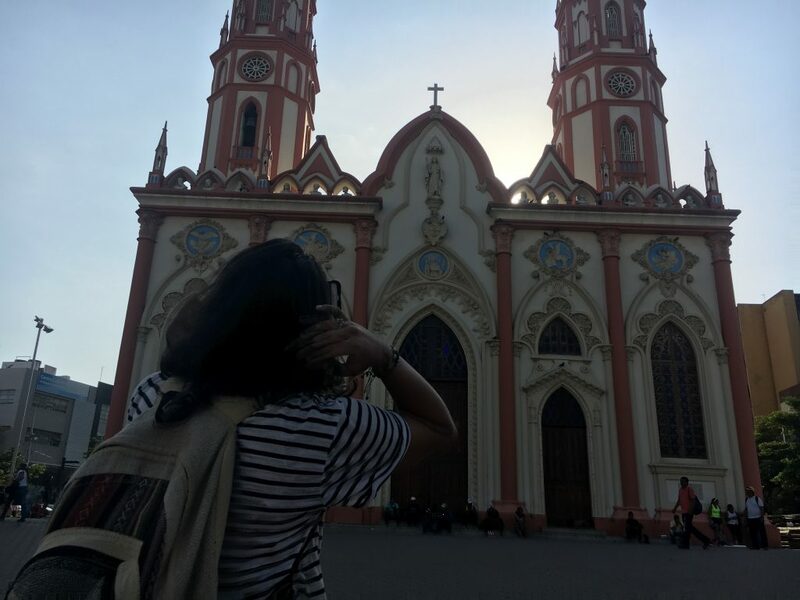 This trip taught me a lot of history and culture, but what I appreciated the most was that Barranquilla became a place that I will be attached to forever. I see myself making trips back there at some point in the future, to revisit the beautiful places near the city, have some food that I can’t get anywhere else, and catch up with new friends. I think it’s time to start a travelling fund for myself. out of the country, Barranquilla and Colombia have special places in my heart. I was in different place, with its own culture and society, different than my own here. And that feeling is unlike another, at least for me. It might sound crazy, but Barranquilla is like a second home. With the friends that I’ve made, the family that I stayed with who treated me as family and taught me some things, with some good memories, it is hard to say it isn’t a place that I can go for a different setting that I would be comfortable in. I am already considering going to Barranquilla with the program again if I can next summer. Or who knows? I might go on my own time in the near future during a school break. We’ll see!